Your spine is your lifeline. A string of 33 vertebrae, this bony structure is naturally designed in such a way that it balances stability and mobility. It protects the spinal cord, the major pathway of nerves sending signals to our brain. That spinal cord is intricately connected to our gut, our vital organs. And every single time we touch something with our hands and arms, feet and legs, our spine is carrying those messages to our brain. Our spine is a key part of how we both interact with and understand the world. With the spine being that important, it’s critical that we protect it on our yoga practice, and in our daily lives. When you have CF, some of the things we do in our daily lives (like coughing a lot, or sitting for long periods of time) can pull the spine out of this natural alignment. Restoring the natural curvature of the spine can release tension and free your breath. It can even give you more stamina during exercise because your skeletal structure is doing more of the heavy work instead of your muscles. A “neutral spine” is simply the spine in it’s natural state, when it’s not bent in any particular direction. When the vertebrae are stacked in their natural alignment, there are some natural curves to the way the vertebrae all fit together like puzzle pieces. 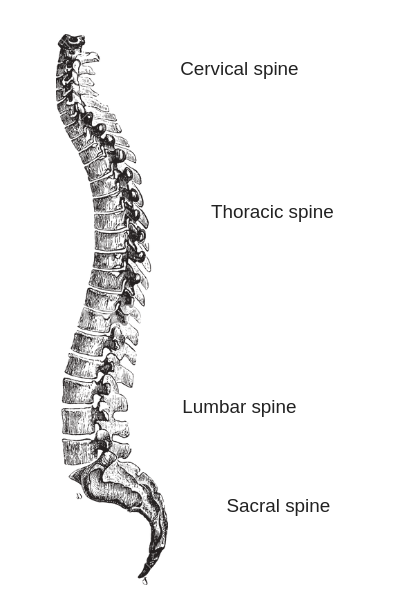 Here you can see a diagram of the spine – viewed from the side. See how it’s not just a straight line, but has natural curves? Some of them curve inward: at the “cervical spine” of the neck, and the “lumbar spine” of the low back. And some of them curve outward – at the “thoracic spine” of the upper back, and the “sacral spine” which is the very bottom section at the pelvis. An inward curve is called “lordosis” and an outward curve is called “kyphosis.” Lordotic and kyphotic curves are both naturally present in the spine. That said – sometimes these curves can get TOO big. It’s really common for people to experience over-curvature of the upper back . . . a condition called Kyphosis. The thoracic spine gets overly round as we spend a lot of time sitting down, shrugging our shoulders, driving, typing at computers, staring down at our smartphones (guilty). This issue can be even greater though for people with CF, as we tend to cough a lot, which accentuates that curve and creates a lot of muscular fatigue. Here are a few tips for developing and maintaining your neutral spinal alignment, and making sure to protect your spine in your yoga practice. Imagine there’s an invisible string coming right out of the crown of your head, that’s lifting you straight upward. Your shoulders relaxing down and back, and the shoulderblades start to slide a little bit toward the spine and toward each other. This helps to reset your body’s natural spinal curvature. This “tall” feeling also helps you to create space between each of your vertebrae before you ask them to move. This helps to keep your vertebrae from twisting or grinding against each other as you move. 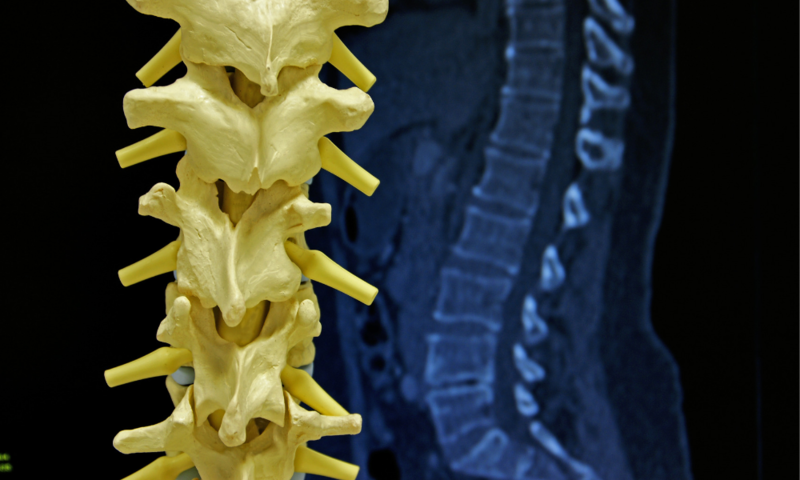 The spine is incredibly mobile, since it’s constructed in such a way that each vertebrae can move independently. You can think of the spine as a string of pearls, where each one is able to twist or bend separately from its neighbor. The spine has three ways that it can move, and different yoga poses will use different motions. This is the motion that we do in a cat-cow flow, for example. Flexion is the “cat” position, where we scoop the belly inward. Extension is the “cow” pose, where we open up the chest with a backbend. Twisting motions happen in the neck (cervical) and low back (lumbar) curves of the spine, which are inherently most mobile. This motion occurs in any of our twisted poses where our chest is pointing a different direction than our hips, and/or we’re turning our head toward our shoulder. Lateral flexion opens up the side of the body, as the ribs lift up away from the hips. Lateral flexion is inherently asymmetrical. For safety, only ask your spine to move in ONE direction at a time (on or off the mat!). This reduces the risk of injury and trains you to think more intentionally about the way you’re moving your body. A) Hinge at the hips instead of rounding the spine as you bend forward. B) Keep knees bent when moving in and out of forward folds. C) In deep forward bends, use a “sinking style” breath. On the inhale, “think tall” and lift the crown of the head up to create space between the vertebrae. On the exhale, hinge forward at the hips to deepen your stretch. In Kyphosis, the back muscles are underused so they get weak and overstretched. At the same time, the muscles in between the ribs, the intercostals, start to shorten as they don’t often get stretched out. This is why when you have Kyphosis, sometimes even the simple act of standing straight or sitting upright can be tiring. In yoga, we have a chance to strengthen the back while lengthening the front of the body. This is why chest-opening backbends can feel so delicious to those of us who have CF. An active backbend, like locust pose, engages the back muscles so that they can strengthen. A passive backbend, like supported fish, lets the chest open up in a relaxed position so that your intercostals can have a chance to stretch out. Flows like downward dog to plank, and spinal balance flows, can also help to build that important back and core strength. It all takes practice and a healthy dose of body awareness, but with time we can bring the natural curves of the spine back into balance. Want to try putting these concepts into practice? Join us this month for Alignment-Oriented yoga on Saturday mornings, where we’ll be bringing our awareness to these aspects of our yoga poses. Hope to see you on the mat!